Tapering-Leaf Mycetia is an erect fleshy herb with leaves up to 27 x 10 cm, elliptic-oblong, tapering at tip. Nerves are up to 20 pairs, prominent, parallel, leaf-stalk 5-8 cm long, stipule 12 mm long, ovate, pointed, membraneous. Flowers are borne in cymes 5-7 cm across, in leaf-axils, stalked. 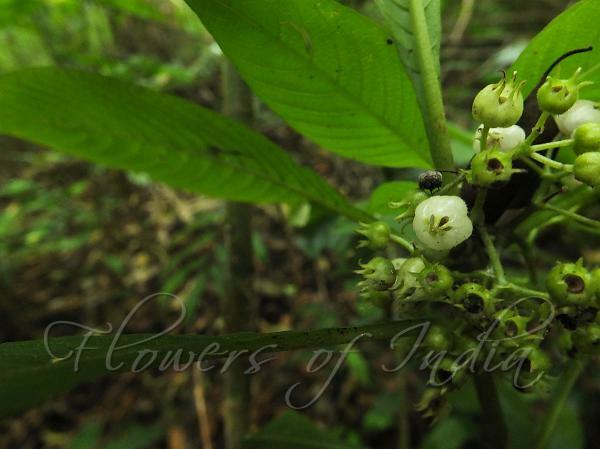 Flowers are 6 mm long, stalked, calyx 6 mm long, sepals 5, tapering. Flowers are blue, tube short, petals 5, ovate, spreading, stamens adnate to the flower tube, anthers linear, ovules many on peltate placentas; style short; stigmas linear. Berry is 8 mm across, white, fleshy, seeds many, angular. 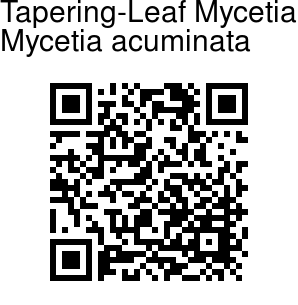 Tapering-Leaf Mycetia is found in Western Ghats. Flowering: August-January. Identification credit: Siddarth Machado Photographed in Brahmagiri Wildlife Sanctuary, Karnataka.